This article is about the 2015 film. For the 2005 film, see Fantastic Four (2005 film). For the unreleased 1994 film, see The Fantastic Four (unreleased film). Fantastic Four (stylized as FANT4STIC) is a 2015 American superhero film loosely based on the Marvel Comics superhero team of the same name. It is the third theatrical Fantastic Four film to be distributed by 20th Century Fox, and a reboot of the Fantastic Four film franchise. Directed by Josh Trank, who co-wrote the screenplay with Jeremy Slater and Simon Kinberg, the film stars Miles Teller, Michael B. Jordan, Kate Mara, Jamie Bell, Toby Kebbell, Reg E. Cathey, and Tim Blake Nelson. In Fantastic Four, the team must learn to harness their superhuman abilities gained from an alternate universe to save Earth from a friend turned enemy. Development of the film began in 2009 after Fox announced plans to reboot the franchise. Trank was hired to direct in July 2012 and the principal characters were cast in January 2014. Principal photography began in May 2014 in Baton Rouge, Louisiana and lasted for two months. Dissatisfied with the production, Fox executives mandated reshoots, which took place in January 2015. Fantastic Four premiered at Williamsburg Cinemas in New York City on August 4, 2015, and was released on August 7 in the United States. The film was a major critical and commercial failure, grossing $168 million worldwide against a production budget of $120 million. Reviewers criticized the film for its characterization, storylines, acting and special effects. At the 36th Golden Raspberry Awards, it won in the categories for Worst Director, Worst Prequel, Remake, Rip-Off, or Sequel, and Worst Picture (the latter tied with Fifty Shades of Grey), and was also nominated for Worst Screen Combo and Worst Screenplay. Childhood friends Reed Richards and Ben Grimm have worked together on a prototype teleporter since youth, eventually attracting the attention of Professor Franklin Storm, director of the Baxter Foundation, a government-sponsored research institute for young prodigies. Reed is recruited to join them and aid Storm's children, scientist Sue Storm and the somewhat reckless technician and her younger brother Johnny Storm, into completing a "Quantum Gate" designed by Storm's wayward protégé, Victor von Doom, who begrudgingly agrees to help due to his unrequited feelings for Sue. The experiment is successful, and the facility's supervisor, Dr. Allen, plans to send a group from NASA to venture into a parallel dimension known as "Planet Zero". Disappointed at being denied the chance to join the expedition, Reed, Johnny, and Victor along with Ben use the Quantum Gate to embark on an unsanctioned voyage to Planet Zero, which they learn is a world filled with otherworldly substances. Victor attempts to touch the green-lava like substance, causing the surface they are on to collapse and the ground to erupt. Reed, Johnny, and Ben return to their shuttle just as Sue brings them back to Earth. Victor is seemingly killed after he falls into the collapsing landscape. The machine explodes, altering Reed, Sue, Johnny, and Ben on a molecular-genetic level, affording them superhuman abilities beyond their control: Reed can stretch like rubber, Susan can become invisible and generate force shields, Johnny can engulf his entire body in fire and fly, and Ben becomes bigger and develops a rock-like hide which gives him superhuman strength and durability. They are then placed in government custody and confinement to be studied and have their conditions and abilities tested. Blaming himself for the accident, Reed escapes from the facility and tries to find a cure for their changes. One year later, Reed is now a fugitive and has built a suit that is able to adapt to his body's plasticity and help him control his ability. Hiding in Central America, he is eventually found by the United States military with Sue's help and captured by Ben, who has become a military asset along with Johnny and Sue. Johnny and Sue have been outfitted with specialized suits designed to help them stabilize and control their abilities. Reed is brought to Area 57, where Dr. Allen conscripts him to open another portal to Planet Zero in exchange for giving Reed the necessary resources to find a cure. Arriving in Planet Zero, Dr. Allen's explorers find Victor, who has been fused to his spacesuit and can now control the elements, as well as having telekinetic abilities, and bring him back to Earth. Believing the human race needs to be destroyed so he can rebuild Planet Zero in his image, Victor kills scientists and soldiers in the base including Dr. Allen and Professor Storm and returns to Planet Zero using the Quantum Gate, with Ben, Johnny, Reed, and Sue in pursuit. Now dubbing himself "Doom", Victor activates a portal on Planet Zero using the Quantum Gate II, and a structure consisting of the rock formations in Planet Zero he made while in the realm, that begins consuming the landscape of the Earth. He is confronted by the four and, after a short battle, Ben punches Doom into the portal's energy beam, disintegrating him while Johnny closes the portal. Returning to Earth, the group is rewarded for their heroics by being given a new base of operations by the US military known as "Central City" to study their abilities. They decide to use their powers to help people and adopt the mantle of the "Fantastic Four". Richards has been exploring the universe in his garage after school. After being transformed by one of his experiments, he gains the ability to stretch his body into different forms and lengths. Teller said of the role, "When I read the script, I didn't feel like I was reading this larger-than-life, incredible superhero tale. These are all very human people that end up having to become, I guess, what is known as the Fantastic Four. So for me it was just a really good story and gives me an opportunity to play something different from my own skin." A troublemaker, and thrill-seeker, he has the ability to mentally create and manipulate fire and fly. Jordan said of the cast, "We're more or less a bunch of kids that had an accident and we have disabilities now that we have to cope with, and try to find a life afterwards – try to be as normal as we can." Jordan previously worked with Trank on 2012's Chronicle, and according to Trank, Jordan's character in Chronicle shares characteristics with Johnny Storm. Trank has described Storm as "smart, hilarious and charismatic." Intelligent, independent and sarcastic, Storm has the ability to create and manipulate light. This allows her to create force-fields and turn herself invisible. Mara has said that she intended to focus on making her character "as real as possible". Trank has described Storm as "smart, dignified and [with] integrity." Warm, sensitive, a loyal and protective friend, Grimm's stone body gives him super-strength and makes him "indestructible". Trank said Grimm grew up an alienated child in a "tough" neighborhood. Trank also said that Bell has "qualities" of warmth and strength which people would want to see from Grimm. Bell has said that Grimm is the "heart of the group [Fantastic Four]". In preparation for the motion-capture performance, Bell approached actor Andy Serkis for advice. During filming, Bell wore a tracking suit and stilts to match the height and eye-line of The Thing. Evan Hannemann portrays Grimm as a child. A computer technician and computer scientist who is mentored by Dr. Franklin Storm. Doom finds a new father of sorts in Franklin Storm. Angry, vengeful, and bright, Doom was changed in Planet Zero, as were the other characters but he is revealed to be deformed and merged with his space suit and then he decides to adopt his surname Doom as his alias. Kebbell said that he concentrated the most on the voice of the character, adding, "on the animated series, they never got his voice what I imagined it to be when I read the comics as a little boy. What I spent the majority of my time doing was not just being a fan, but being a bit of pedant and making sure I got exactly what I always wanted to see." Kinberg said that Doom is as central to the film as the "titular" heroes. He added that Doom has "aspirations and struggles that are a little bit more classically tragic than the other characters" and that the film would show how he becomes a villain. Dr. Doom's full name in this film was originally going to be "Victor Domashev", but it was changed back to "Victor von Doom" during reshoots, to match his name in the Marvel Comics universe. Kebbell also didn't participate in the re-shoots, meaning another actor played the character of Victor von Doom during the climactic battle. The biological father of Johnny and adoptive father to Sue. Cathey described Franklin as a "brilliant scientist who has achieved much more than he thought he would" and that Franklin's main drive in life is to help "brilliant" kids who may have been dropped through the cracks or who were misunderstood. A scientist who works for the government, and takes part in training the members of the team to hone their abilities. Nelson said that Allen is "responsible for what the creative people do that he has to ring them in and discipline them." Additionally, Dan Castellaneta portrays Mr. Kenny, Reed's teacher and Tim Heidecker appears as Mr. Richards, Reed's stepfather. "This Fantastic Four movie is sort of a celebration of all the Fantastic Four comics that have preceded it. We have elements from the original Fantastic Four that there's a sort of optimism and inspirational quality to the film. In some ways a comedy that was really distinct in the original Fantastic Four. Also, the notion of this dysfunctional surrogate family that comes together and has to work together is very present in the movie that owes a great debt to the originals and this idea that they are scientist and that it's almost like this science adventure, more than being superheroes... We also owe a lot to the Ultimate's and the current crop of Fantastic Four comics." In August 2009, 20th Century Fox announced that they would reboot the Fantastic Four film franchise. Akiva Goldsman was attached as producer and Michael Green was hired to write the screenplay. At the time, actors Adrien Brody and Jonathan Rhys Meyers were considered for the role of Mr. Fantastic, while Kiefer Sutherland was considered for role of The Thing. In July 2012, Josh Trank was hired to direct, and Jeremy Slater was hired as screenwriter. Slater's original script featured the villains Galactus and Dr. Doom with Doom depicted as a spy who becomes a herald of Galactus and eventually the dictator of Latveria. In February 2013, Matthew Vaughn was attached as a producer and Seth Grahame-Smith was hired to polish the script. In October 2013, Simon Kinberg was hired to co-write and produce the film. The Calvary FX was hired in April 2014 for the pre-visualization of the film. According to 20th Century Fox's consultant for their Marvel Comics-based films, Mark Millar, the film would take place in the same universe as the X-Men film series. Although Kinberg contradicted this statement, Bryan Singer confirmed talks of a potential crossover among Fox. Trank has said that the film is heavily influenced by David Cronenberg, that 1981's Scanners and 1986's The Fly influenced the look of the film, and that its overall tone would feel like a "cross between Steven Spielberg and Tim Burton". In January 2014, Kinberg finished rewriting the script, and casting for the roles of Reed Richards and Sue Storm began. Miles Teller, Kit Harington, Richard Madden, and Jack O'Connell were tested for the role of Reed, before Teller was cast. Meanwhile, Kate Mara, Saoirse Ronan, Margot Robbie, and Emmy Rossum were tested for Sue. In February, it was revealed that Michael B. Jordan would play Johnny Storm / Human Torch, and Mara was cast as Sue Storm / Invisible Woman. In March, Toby Kebbell was cast as Victor von Doom, and Teller confirmed that Jamie Bell had been cast as Ben Grimm / The Thing. Sam Riley, Eddie Redmayne, and Domhnall Gleeson were considered for Doctor Doom. In April, Tim Blake Nelson entered final negotiations to play Harvey Elder. In May, Reg E. Cathey was cast as Sue's and Johnny's father, Dr. Storm. Fantastic Four had a production budget of $122 million. Principal photography commenced on May 5, 2014, at the Celtic Media Centre in Baton Rouge, Louisiana and ended on August 23, 2014, lasting for 72 days. Matthew Jensen served as director of photography. The film was planned to be shot in Vancouver, Canada, but was moved to Louisiana due to the state's film production tax incentives. During filming, producers Hutch Parker and Simon Kinberg rewrote Trank's original script and gave the film a different ending. In January 2015, reshoots were ordered by 20th Century Fox executives who were not satisfied with the film. Before the film's release, several sources had reported that there were multiple disagreements between 20th Century Fox and Trank during production. After being unsatisfied with Trank's original cut of the film, Fox ordered their own changes to the film without Trank's supervision, changing and omitting certain major plot points from Trank's original cut. Many other sources claimed that there was "erratic behavior" from Trank on the set of the film, which resulted in Fox's negative treatment of Trank. Trank posted a message on Twitter one day prior to the film's release that criticized the finished film. Expressing heavy dissatisfaction towards the final product, he stated, "A year ago I had a fantastic version of this. And it would've received great reviews. You'll probably never see it. That's reality though." Trank deleted the message shortly after. While Fox distribution chief Chris Aronson claimed that Fox supported Trank's version of the film, Kebbell conversely stated, "I tell you, the honest truth is [Trank] did cut a great film that you’ll never see. That is a shame. A much darker version, and you’ll never see it." The film used the Los Angeles-based company OTOY for the visual effects. According to Trank, with the use of cloud-rendering technology from OTOY, they could create visual effects at a much lower cost. Moving Picture Company, Pixomondo, Rodeo FX and Weta Digital also created visual effects for the film. Moving Pictures Company took on the visual effects for The Thing, rendering a fully digital character based on Jamie Bell's on-set performance and the Human Torch's fiery visual effects. Weta Digital handled Reed Richards' stretch effects. Pixomondo delivered Sue Storm's force-field and cloaking effects and augmented Doom's costume. James E. Price served as the over-all visual effects supervisor. Kinberg stated that the film would be converted to 3D in post-production, but those plans were canceled, with Trank stating that he wanted "the viewing experience of Fantastic Four to remain as pure as possible". A sequence showing The Thing performing a "dive-bomb" in the film was cut due to budget constraints. In January 2015, Marco Beltrami was hired to compose the film's score. Philip Glass was also hired to work on the score with Beltrami. Additionally, American hip-hop recording artist El-P scored the end credits of the film. To promote the film, Kim Nam-joon, known as Rap Monster of the Kpop group Bangtan Boys, and American recording artist Mandy Ventrice, worked on the digital single "Fantastic", which was released alongside the South Korean run of the film. In July 2015, Beltrami attended the 2015 San Diego Comic-Con International to discuss scoring the film. Beltrami described the score as "eerie" and "mysterious", landing it in a "musical territory leaning towards fantasy." The film score was released on August 14, 2015, by Sony Classical Records. In spite of the film's negative reception, the soundtrack still gained a positive response. The teaser trailer for Fantastic Four was released in January 2015 to a generally positive response. Graeme McMillan of The Hollywood Reporter gave the trailer a positive review, calling it a "surprisingly strong step in the right direction for a faithful adaptation of an often-problematic property." Abraham Riesman of New York's Vulture also responded to the trailer positively, saying that the film "could be the most innovative and tonally unique marquee superhero movie." However, correspondents for Newsarama noted that there was "nothing" in the trailer to characterize it as being based on the Fantastic Four, feeling it could have easily been a substitute for similar science fiction films such as 2014's Interstellar. The trailer became the most-watched trailer in 20th Century Fox's history, surpassing the previous record-holder, 2014's X-Men: Days of Future Past. The second trailer for the film was released in April 2015. Sean O'Connell of CinemaBlend called the trailer "amazing" and said that it "does a much better job of setting up everyone's roles." Drew McWeeny of HitFix said the film "looks like it was approached with serious intent" and that the scale "feels positively intimate." In the same month, the cast attended CinemaCon to present footage from the film, which also generated positive reviews. The world premiere of Fantastic Four occurred at Williamsburg Cinemas in New York City on August 4, 2015. It was released in North America on August 7, 2015, on 3,995 screens. In December 2012, the film was scheduled for a March 6, 2015, release date, and was later changed again in November 2013 to June 19, 2015, before settling on its final date of August 7, 2015. Fantastic Four grossed $56.1 million in North America and $111.9 million in other territories for a worldwide total of $168 million, against a production budget of $120 million (estimated $200 million including marketing and distribution costs), making it the lowest grossing Fantastic Four film to date. It received a "C–" rating from audiences surveyed by CinemaScore on a scale of A+ to F, which was referred to by Pamela McClintock of The Hollywood Reporter as "the worst grade that anyone can remember for a marquee superhero title made by a major Hollywood studio." In the United States and Canada, Fantastic Four was projected to take the top spot and earn around $40–50 million on its opening weekend, which would be lower than the opening weekend gross of 2005's Fantastic Four ($56.1 million) and 2007's Fantastic Four: Rise of the Silver Surfer ($58.1 million). The film made $2.7 million from late night previews on the night of August 6. 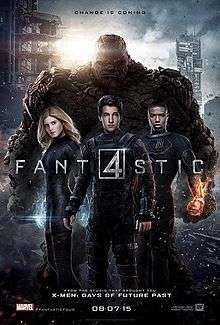 On its opening day, Fantastic Four earned $11.3 million (including Thursday's preview screenings), lower than early tracking, and $25.6 million on its opening weekend, marking one of the lowest openings of all time for a big-budget superhero movie which box office analysts have attributed to poor critical reviews and audience reception. It came in second place behind Mission: Impossible – Rogue Nation ($28.5 million). When asked to comment on the weekend box office results, Chris Aronson, Fox's president of domestic distribution said: "There's not much to say. I have never seen a confluence of events impact the opening of a movie so swiftly," referring to negative reviews and a renegade tweet by Trank that blamed the studio for the poor reviews. In the film's second weekend, it grossed $8 million, dropping 69% from the opening weekend. Its low financial performance led to it being categorized as a box office bomb. It was dubbed the second biggest box office bomb of 2015, behind Tomorrowland, estimating the film's losses to be between $80–100 million. Outside North America, the film grossed $33.1 million on its opening weekend from 43 countries from 8,996 screens, coming at second place behind Rogue Nation at the international box office. While it underperformed in certain countries, it opened at number one in 20 countries. Its top openings were in Mexico ($5.29 million), the United Kingdom, Ireland and Malta ($4.19 million), France ($3.85 million), Venezuela ($3.81 million) and Brazil ($3 million). Film review aggregator Rotten Tomatoes reported an approval rating of 9%, based on 216 reviews, with a rating average of 3.4/10. The site's critical consensus reads, "Dull and downbeat, this Fantastic Four proves a woefully misguided attempt to translate a classic comic series without the humor, joy, or colorful thrills that made it great." The website Metacritic gave the film a weighted average score of 27 out of 100, based on 40 critics, indicating "generally unfavorable reviews". Criticism of Fantastic Four was directed at the special effects, performances, slow pacing, and character designs, especially that of Doctor Doom; the film was also criticized for its gloomy and humorless tone, lack of dynamic between the title characters, and for overall squandering the promise it initially displayed. The film has a lower rating on Rotten Tomatoes than any other film based on a Marvel Comics property. Peter Travers of Rolling Stone gave Fantastic Four one star out of four, calling it "the cinematic equivalent of malware" and "worse than worthless." Jim Vejvoda of IGN criticized the film as "aesthetically drab and dramatically inert", said that the two previous Fantastic Four films "seem better in hindsight", and that the film did not show enough character development between the members of the team. He also criticized the blatant continuity errors, such as Mara's changing hair style and color and Teller's disappearing facial hair, brought on by the film's reshoots. Brian Lowry of Variety found the film to be a technical improvement over the 2005 release but criticized its uneven pacing and writing, saying "Ultimately, Fox's stab at reviving one of its inherited Marvel properties feels less like a blockbuster for this age of comics-oriented tentpoles than it does another also-ran — not an embarrassment, but an experiment that didn't gel." Todd McCarthy of The Hollywood Reporter felt the film is "like a 100-minute trailer for a movie that never happens." He called the film "maddeningly lame and unimaginative" in addition to criticizing the visual style as a "dark, unattractive, gloomy mode." In a review for Screen Daily, Tim Grierson criticized the film's narrative as nonsensical, making the film "progressively more muddled and tedious." In contrast, David Jenkins of Little White Lies praised Fantastic Four for its stylistic deviation from other recent superhero films, and argued that the film's characters "make decisions which may appear to lack credibility, but the writing works hard to show you why these people are doing what they are doing – and it's not just haphazard patching work, but believable reasons which build on the themes of the movie". James Berardinelli gave the film two and a half stars out of four, opining that Fantastic Four is "no better or worse [than] the other superhero movies of 2015", welcoming the dark tone, and praising the performance of the main actors. However, he stated that as a superhero film, "it falls into the 'adequate' range of the spectrum - neither memorable nor forgettable." Yahoo! Movies, Toronto Sun, Indiewire, and Rolling Stone have included Fantastic Four in their lists compiling the worst films of 2015. Fantastic Four was released by 20th Century Fox Home Entertainment on Blu-ray Disc and DVD on December 15, 2015. Before Fantastic Four began filming, 20th Century Fox announced plans for a sequel with a scheduled release date of July 14, 2017. Fox then rescheduled the release for June 2, 2017, with War for the Planet of the Apes taking its place on the July 14, 2017, slot. It changed the release date again to June 9, 2017, to be two weeks after Star Wars: Episode VIII's scheduled release on May 26, 2017. Due to Fantastic Four's poor box office performance and negative reviews, Pamela McClintock of The Hollywood Reporter said that it "throws into question whether Fox will move ahead with a sequel". Phil Hoad of The Guardian said it would "be interesting" to see if Fox proceeds with a sequel and if it keeps the "gritty-on-paper" tone, noting that if Fox did not produce a sequel, the film rights would revert to Marvel Studios. Despite the performance, it was reported in September 2015 that Fox still planned to produce a sequel, with Simon Kinberg working on the project. Drew McWeeny of HitFix said that while a sequel may not be produced in time for the 2017 release date, Fox would likely attempt to salvage the franchise, working with Trank's defined vision and adding adjustments to it. While Kinberg affirmed his intent to make a sequel, Kate Mara said that a sequel looked unlikely, despite expressing interest in reprising her role as Sue Storm. In November 2015, the sequel was removed from Fox's release schedule. In May 2016, Kinberg reaffirmed his intent to make another Fantastic Four film with the same cast. Later that month, Toby Kebbell stated he had no interest in reprising his role as Dr. Doom if a sequel were to happen. Both Miles Teller and Kate Mara said that they were open to returning for a sequel. ↑ "Fantastic Four (12A)". British Board of Film Classification. July 29, 2015. Retrieved July 31, 2015. 1 2 3 McClintock, Pamela (August 5, 2015). "Box-Office Preview: 'Fantastic Four' to Lead Jam-Packed Weekend". The Hollywood Reporter. Retrieved August 6, 2015. 1 2 "Fantastic Four (2015)". Box Office Mojo. Retrieved February 26, 2016. 1 2 Pallotta, Frank (August 7, 2015). "'Fantastic Four' box office could be doomed by its bad reviews". CNNMoney. Retrieved August 11, 2015. 1 2 Lang, Brent (August 9, 2015). "Box Office: 'Fantastic Four' Bombs With $26.2 Million Weekend". Variety. Retrieved January 30, 2016. 1 2 Hoad, Phil (August 11, 2015). "Fantastic Four flop: the biggest superhero disaster since Catwoman". The Guardian. Retrieved January 30, 2016. ↑ "FANTASTIC FOUR In Theaters August 2015". Retrieved April 23, 2015. 1 2 Vejvoda, Jim (March 8, 2014). "Miles Teller on What Appealed to Him About The Fantastic Four Reboot". IGN. Retrieved March 8, 2014. ↑ Roedel, Jeff (July 22, 2014). "Michael B. Jordan talks Fantastic Four". 225batonrouge.com. Retrieved August 3, 2014. 1 2 3 4 5 Weintaub, Steve (January 27, 2015). "'The Fantastic Four' Movie Details, Images, Easter Eggs, Tone, and More". Collider. Retrieved January 27, 2015. ↑ "Fantastic Four Michael B. Jordan Cast Commentary". April 4, 2015. Retrieved April 10, 2015. ↑ Wigler, Josh (July 15, 2014). "Kate Mara, Future Fantastic Four Star, Has Never Read a Comic Book". MTV News. Retrieved August 3, 2014. 1 2 Nemiroff, Perri (February 26, 2015). "Fantastic Four Details on The Thing's Transformation Cocoon and More". Retrieved February 27, 2015. ↑ Cabin, Chris (July 11, 2015). "Fantastic Four Comic-Con Panel Recap: Final Trailer Details". Retrieved July 12, 2015. ↑ Blickley, Leigh (April 9, 2015). "Jamie Bell Worked With Andy Serkis to Perfect The Thing in Fantastic Four". Retrieved April 13, 2015. 1 2 3 Failes, Ian (August 9, 2015). "Fantastic five". FXguide. Retrieved August 18, 2015. 1 2 Goldberg, Matt (November 10, 2014). "Exclusive: Toby Kebbell Reveals Doctor Doom's Radically New Origin in THE FANTASTIC FOUR Movie". Collider. Retrieved November 12, 2014. 1 2 Franich, Darren (January 30, 2015). "'X-Men: Apocalypse': Rose Byrne returning as Moira MacTaggert -- Exclusive". Entertainment Weekly. Retrieved January 31, 2015. ↑ Marston, George (August 6, 2015). "DR. DOOM Actor Reveals Some FANTASTIC FOUR Reshoots Were Due To Negative Fan Reaction". Newsarama. Retrieved January 29, 2016. 1 2 Yamato, Jen (June 7, 2016). "The Best Actor You May Never Recognize". The Daily Beast. Retrieved July 16, 2016. ↑ "The Fantastic Four: Reg E. Cathey "Dr. Storm" Behind the Scenes Movie Interview - 2015". July 30, 2015. Retrieved August 18, 2015. ↑ "Fantastic Four interview — Tim Blake Nelson". July 30, 2015. Retrieved August 18, 2015. ↑ Walker, R.V. (July 14, 2015). "The Final FANTASTIC FOUR Trailer is Here". Nerdist. ↑ "Fox is Rebooting Fantastic Four". SuperHeroHype.com. August 31, 2009. Retrieved June 23, 2013. ↑ "Comic-Con: Fantastic Four Director Confirmed While Daredevil Director Exits". SuperHeroHype.com. July 11, 2012. Retrieved June 23, 2013. ↑ Perry, Spencer (July 13, 2012). "Comic-Con: Fantastic Four Reboot Gets a Writer". SuperHeroHype.com. Retrieved June 23, 2013. ↑ Chitwood, Adam (August 19, 2015). "Original 'Fantastic Four' Script Included Galactus, Mole Man, and Much More Action". Collider.com. Retrieved August 22, 2015. ↑ Faraci, Devin (August 18, 2015). "What Was FANTASTIC FOUR Like Before Simon Kinberg?". SuperHeroHype.com. Retrieved February 20, 2016. ↑ Lesnick, Silas (February 22, 2013). "Matthew Vaughn to Produce Fantastic Four". Retrieved June 23, 2013. ↑ Lesnick, Silas (February 26, 2013). "Seth Grahame-Smith Boards Fantastic Four". SuperHeroHype.com. Retrieved June 23, 2013. ↑ Kit, Borys (October 1, 2013). "Simon Kinberg Tapped to Write 'Fantastic Four' (Exclusive)". The Hollywood Reporter. Retrieved October 2, 2013. ↑ "SFX239 Preview: Mark Millar On Fantastic Four". SFX.co.uk. August 19, 2013. Archived from the original on August 22, 2013. Retrieved August 23, 2013. ↑ Ryan, Mike (May 12, 2014). "'Fantastic Four' Writer-Producer Simon Kinberg on Shared Universes and the Challenges of an Origin Story". Screencrush. Archived from the original on May 14, 2014. Retrieved May 13, 2014. ↑ "Bryan Singer Hints At X-Men/Fantastic Four Crossover (Exclusive)". Yahoo UK. July 23, 2015. Retrieved December 31, 2015. ↑ "Fantastic Four: EW preview". Entertainment Weekly. April 9, 2015. Retrieved February 9, 2016. ↑ Kroll, Justin (January 21, 2014). "Fantastic Four' Script In, Actors to Test by End of Month". Variety. Retrieved August 16, 2014. ↑ Kroll, Justin (October 9, 2013). "'Fantastic Four': Actors and Actresses Lining Up for Roles". Variety. Retrieved May 6, 2014. ↑ Kit, Borys (February 5, 2014). "Fantastic Four' Screen Tests: Emmy Rossum, Kate Mara and Miles Teller in the mix". The Hollywood Reporter. Retrieved August 16, 2014. ↑ "Toby Kebbell to Play 'Fantastic Four' Villain Doctor Doom (EXCLUSIVE)". Variety. April 1, 2014. Retrieved April 1, 2014. ↑ Sneider, Jeff. "'Fantastic Four': Dr. Doom Short List Down to 4 Actors With Accents (Exclusive)". The Wrap. Retrieved May 6, 2014. ↑ Kit, Borys (April 30, 2014). "Tim Blake Nelson in Final Talks to Join 'The Fantastic Four' (Exclusive)". The Hollywood Reporter. Retrieved April 30, 2014. ↑ Siegel, Tatiana (May 8, 2014). "Fox's 'Fantastic Four' Reboot Adds 'The Wire's' Reg E. Cathey (Exclusive)". The Hollywood Reporter. Retrieved May 8, 2014. ↑ McClintock, Pamela (April 21, 2015). "Summer Box Office: What's Behind Warner Bros.' Risky Move to Release Nine Movies". The Hollywood Reporter. Retrieved April 21, 2015. ↑ Scott, Mike (May 5, 2014). "'Fantastic Four' reboot begins filming today in Baton Rouge; here's what we know so far". Times-Picayune. Retrieved May 5, 2014. ↑ Christine (May 5, 2014). "'Fantastic Four' begins filming in Louisiana!". onlocationvacations.com. Retrieved May 6, 2014. ↑ Panda, Robo (August 23, 2014). "Fantastic Four Director Josh Trank Tweets a First Look At The Thing". Uproxx. Retrieved August 24, 2014. ↑ Andreeva, Nellie (December 3, 2013). "Six Montana Artists Agents & Executives Led By Toppers Matt Birch & Ralph Berge Join APA". Deadline.com. Retrieved July 28, 2014. ↑ Lang, Brent (July 24, 2013). "'Fantastic Four' Reboot Moving Production From Vancouver to Louisiana (Exclusive)". The Wrap. Retrieved August 21, 2014. ↑ "'Fantastic Four' Flop: How Much Damage Did Director Josh Trank's Tweet Cause?". TheWrap. August 9, 2015. Retrieved August 9, 2015. ↑ Romano, Nick (January 16, 2015). "The Fantastic Four May be a Mess; Reshoots Ordered; Trailer Date Revealed". Paste. Retrieved August 7, 2015. ↑ Agar, Chris (January 15, 2015). "'Fantastic Four' Rumors: Reboot a 'Mess' & Reshoots Scheduled [Updated]". Screen Rant. Retrieved August 7, 2015. ↑ "'Fantastic Four': What We Know About What Went Wrong". Screen Rant. August 8, 2015. Retrieved August 13, 2015. ↑ "Fantastic Four's director says Fox made his great movie terrible. Is he right?". Vox. August 12, 2015. Retrieved August 13, 2015. ↑ Breznican, Anthony (August 7, 2015). "Why did Fantastic Four director Josh Trank slam his own movie?". Entertainment Weekly. Retrieved August 7, 2015. ↑ "Josh Trank Responds To Fantastic Four Criticism". Cinema Blend. August 7, 2015. Retrieved August 7, 2015. ↑ "'Fantastic Four' Flop: How Much Damage Did Director Josh Trank's Tweet Cause?". TheWrap. August 9, 2015. Retrieved April 1, 2016. ↑ Takahashi, Dean (March 19, 2013). "Otoy's cloud rendering tools to be used in indie games and the Fantastic Four movie". VentureBeat. Retrieved October 4, 2014. ↑ "MPC — Fantastic Four". Retrieved February 4, 2015. ↑ "Weta Digital". Retrieved February 4, 2015. ↑ Frei, Vincent (August 4, 2015). "Fantastic Four". Retrieved August 16, 2015. ↑ "Writer/Producer Simon Kinberg Talks THE FANTASTIC FOUR, Post-Converting to 3D, the Grounded Tone, and Writing Towards the Sequels". Collider.com. May 8, 2014. Retrieved June 13, 2016. ↑ Lloyd, Kenji (July 11, 2015). "Exclusive: Fantastic Four 3D Post-Conversion Officially Cancelled, Will Only Be Released in 2D". finalreel.co.uk. Retrieved July 11, 2015. ↑ "Here's what the mysterious deleted Fantastic Four scene was supposed to be...". Entertainment Weekly. August 18, 2015. Retrieved October 18, 2015. ↑ "Marco Beltrami to Score 'The Fantastic Four' Reboot". Film Music Reporter. January 6, 2015. Retrieved January 7, 2015. ↑ Beauchemin, Molly (July 11, 2015). "El-P Scored The End Credits For The New Fantastic Four Movie". Retrieved July 16, 2015. ↑ "Rap Monster to drop a digital single in collaboration with Hollywood film 'Fantastic Four'!". allkpop.com. July 31, 2015. Retrieved July 16, 2015. ↑ Charrow, Abel (July 11, 2015). "Junkie XL, Brian Tyler, Marco Beltrami Discuss Scoring for Superheroes and Franchises". Retrieved July 16, 2015. ↑ "Fantastic Four Soundtrack Details". July 9, 2015. Retrieved July 10, 2015. ↑ Tillnes, Jørn. "Soundtrack Review: Fantastic Four". Soundtrack Geek. Retrieved August 2, 2016. ↑ Manduteanu, Mihnea. "Soundtrack review: Fantastic four (Marco Beltrami and Philipp Glass – 2015)". Soundtrack Dreams. Retrieved August 2, 2016. ↑ Trate, Robert. "Fantastic Four Soundtrack Review". Scifi Movie Page. Retrieved August 2, 2015. ↑ "The Fantastic Four Trailer is Here!". SuperHeroHype.com. January 27, 2015. Retrieved January 28, 2015. ↑ McMillan, Graeme (January 27, 2015). "How the New 'Fantastic Four' Trailers Stays Faithful to the Original Comics". The Hollywood Reporter. Retrieved January 28, 2015. ↑ Riesman, Abraham (January 28, 2015). "The Fantastic Four Movie Seems Really Good!". Vulture.com. Retrieved January 28, 2015. ↑ "The FANTASTIC FOUR Trailer: Our First Reactions". Newsarama. January 27, 2015. Retrieved January 29, 2015. ↑ Perry, Spencer (April 19, 2015). "The New Trailer for Fantastic Four is Here!". Retrieved April 20, 2015. ↑ O'Connell, Sean (April 19, 2015). "A New Fantastic Four Trailer Is Online and It's Amazing". Retrieved April 20, 2015. ↑ McWeeny, Drew (April 19, 2015). "New Fantastic Four trailer gives us our best look yet at the team in action". Retrieved April 20, 2015. ↑ McNary, Dave (April 23, 2015). "Fantastic Four Footage, Cast Impress Exhibitors at CinemaCon". Retrieved April 24, 2015. ↑ Reed, Sam (August 5, 2015). "Kate Mara in Valentino at the Fantastic Four Premiere". The Hollywood Reporter. Retrieved August 4, 2015. ↑ McClintock, Pamela (September 18, 2014). "'X-Men' Spin-Off 'Deadpool' Gets Winter 2016 Release Date". The Hollywood Reporter. Retrieved September 18, 2014. ↑ "Release Date Set for Fantastic Four Reboot". SuperHeroHype.com. December 8, 2012. Retrieved July 16, 2014. ↑ Perry, Spencer (November 12, 2013). "Fantastic Four, The Secret Service and Assassin's Creed Get New Release Dates". SuperHeroHype.com. Retrieved July 16, 2014. 1 2 Barnes, Brooks (August 9, 2015). "'Fantastic Four' Lacks Superpowers at Box Office". The New York Times. Retrieved August 10, 2015. ↑ "'Fantastic Four' Gets Worst CinemaScore Ever for Studio Superhero Movie". The Hollywood Reporter. Retrieved August 9, 2015. ↑ Busch, Anita (August 4, 2015). "'Fantastic Four' Will Top Busy Box Office Weekend – Preview". Deadline.com. Retrieved August 6, 2015. ↑ Lang, Brent (August 4, 2015). "Box Office: 'Fantastic Four' Muscles in on 'Mission: Impossible 5'". Variety. Retrieved August 6, 2015. ↑ Keith Simanton (August 6, 2015). "Forecast: 'Fantastic Four' Takes First". Box Office Mojo. Retrieved August 7, 2015. ↑ Ford, Rebecca (August 7, 2015). "Box Office: 'Fantastic Four' Takes in $2.7 Million Thursday Night". The Hollywood Reporter. Retrieved August 7, 2015. ↑ McClintock, Pamela (August 7, 2015). "Box Office: 'Fantastic Four' Falls Flat, Could Lose to 'Mission: Impossible'". The Hollywood Reporter. Retrieved August 8, 2015. ↑ "Fantastic Four (2015) - Daily Box Office Results". September 29, 2015. Retrieved September 29, 2015. ↑ McClintock, Pamela (August 9, 2015). "Box Office: 'Fantastic Four' Flops with $26.2M, Loses to 'Mission: Impossible'". The Hollywood Reporter. Retrieved August 9, 2015. ↑ Kilday, Gregg (August 16, 2015). "Box Office: 'Straight Outta Compton' Breaks Out With Massive $56.1M". The Hollywood Reporter. Retrieved August 18, 2015. ↑ Vary, Adam B. (August 9, 2015). ""Fantastic Four" Is A Major Box Office Bomb". BuzzFeed. Retrieved August 9, 2015. 1 2 McClintock, Pamela (September 4, 2015). "Summer Box-Office Flops: 'Tomorrowland,' 'Fantastic Four' Top List". The Hollywood Reporter. Retrieved September 5, 2015. ↑ Brent Lang (November 4, 2015). "'Fantastic Four' Failure Takes Bite Out of Fox's Earnings". Variety. Retrieved November 4, 2015. ↑ Nancy Tartaglione (August 10, 2015). "'Rogue Nation' Flies Higher In 2nd Frame With $65M; 'Fantastic Four' No. 2 With $33.1M Bow – Intl Box Office Update". Deadline.com. Retrieved August 11, 2015. ↑ Nancy Tartaglione (August 23, 2015). "'Terminator' Back To No. 1 As China Re-Opens; 'M:I5' Adds $25M; 'Hitman' Contracts $8.5M – Intl B.O. Update". Deadline.com. (Penske Media Corporation). Retrieved August 14, 2015. 1 2 "Fantastic Four (2015)". Rotten Tomatoes. Flixster. Retrieved November 9, 2015. ↑ "Fantastic Four". Metacritic. CBS Interactive. Retrieved August 18, 2015. ↑ "Review Revue: 'Fantastic Four,' 'Shaun the Sheep,' 'Ricki and the Flash,' and 'The Gift'". The Wall Street Journal. August 7, 2015. Retrieved August 9, 2015. ↑ Smith, Troy L. (August 6, 2015). "'Fantastic Four' reboot may be the worst superhero movie of all time". The Plain Dealer. Retrieved August 18, 2015. ↑ Keyes, Rob (August 8, 2015). "'Fantastic Four' Is The Worst Reviewed Marvel Movie Ever". Screen Rant. Retrieved August 18, 2015. ↑ Travers, Peter (August 6, 2015). "How bad is this reboot of Marvel's first superheroes? Worse than you can imagine". Rolling Stone. Retrieved August 11, 2015. ↑ Vejvoda, Jim (August 6, 2015). "Fantastic Four Review". IGN. Retrieved August 7, 2015. ↑ Brian Lowry (August 4, 2015). "Film Review: 'Fantastic Four'". Variety. Retrieved August 4, 2015. ↑ Todd McCarthy (August 5, 2015). "'Fantastic Four': Film Review". The Hollywood Reporter. Retrieved August 5, 2015. ↑ Tim Grierson (August 4, 2015). "'Fantastic Four': Review". Screen Daily. Retrieved August 4, 2015. ↑ David Jenkins (August 5, 2015). "Fantastic Four Review". Little White Lies. Retrieved August 5, 2015. ↑ Berardinelli, James (August 6, 2015). "Fantastic Four (United States, 2015)". ReelViews. Retrieved August 11, 2015. ↑ "The 10 Worst Movies of 2015". Yahoo.com. December 17, 2015. Retrieved March 10, 2016. ↑ "The 10 worst movies of 2015 starring Fantastic Four, Jurassic World, Sisters and". Torontosun.com. December 29, 2015. Retrieved March 10, 2016. ↑ Kiang, Jessica. "The 20 Worst Films Of 2015 | The Playlist". Blogs.indiewire.com. Retrieved March 10, 2016. ↑ Ehrlich, David (December 21, 2015). "10 Worst Movies of 2015". Rolling Stone. Retrieved March 10, 2016. ↑ CS (February 27, 2016). "Razzie Awards 2016 Winners Announced". ComingSoon.net. Retrieved February 29, 2016. ↑ "Fantastic Four (Blu-ray + Digital HD) (Widescreen)". Retrieved October 20, 2015. ↑ Miller, Jenni (March 21, 2014). "The 2015 'Fantastic Four' Reboot Will Get a Sequel in 2017". Moviefone. Retrieved September 5, 2015. ↑ Sneider, Jeff (January 5, 2015). "Channing Tatum's 'Gambit' Gets 2016 Release Date; 'Fantastic Four' Sequel Moves Up". TheWrap. Retrieved September 5, 2015. ↑ Chitwood, Adam (March 12, 2015). "Fantastic Four 2 Fears the Force, Moves Back a Week to June 9, 2017". Collider.com. Retrieved September 5, 2015. ↑ Hoad, Phil (August 11, 2015). "Fantastic Four flop: the biggest superhero disaster since Catwoman". The Guardian. Retrieved September 5, 2015. 1 2 Wickman, Kase (September 14, 2015). "'Fantastic Four' Boss Is 'Figuring Out' How To Make A Sequel Happen". MTV News. MTV. Retrieved September 15, 2015. ↑ McWeeny, Drew (August 10, 2015). "Here's the strangest footnote to the entire Josh Trank/Fantastic Four story". HitFix. Retrieved September 5, 2015. ↑ Perry, Spencer (November 24, 2015). "Fantastic Four Sequel Pulled from Fox Schedule". Superhero Hype!. Retrieved November 25, 2015. ↑ Lambie, Ryan (May 13, 2016). "Fantastic Four 2 Could Happen With Same Cast". Den of Geek. Retrieved May 14, 2016. ↑ "Toby Kebbell Has No Interest In Making a Fantastic Four Sequel". Yahoo! Movies. Retrieved May 31, 2016. ↑ Shirey, Paul (August 9, 2016). "Exclusive: Miles Teller talks more Fantastic Four & critical impact". Retrieved August 10, 2016. ↑ "Kate Mara Is Game for Fantastic Four 2". IGN. August 24, 2016. Retrieved August 24, 2016.